Because 13 colors would be bad luck, obviously. 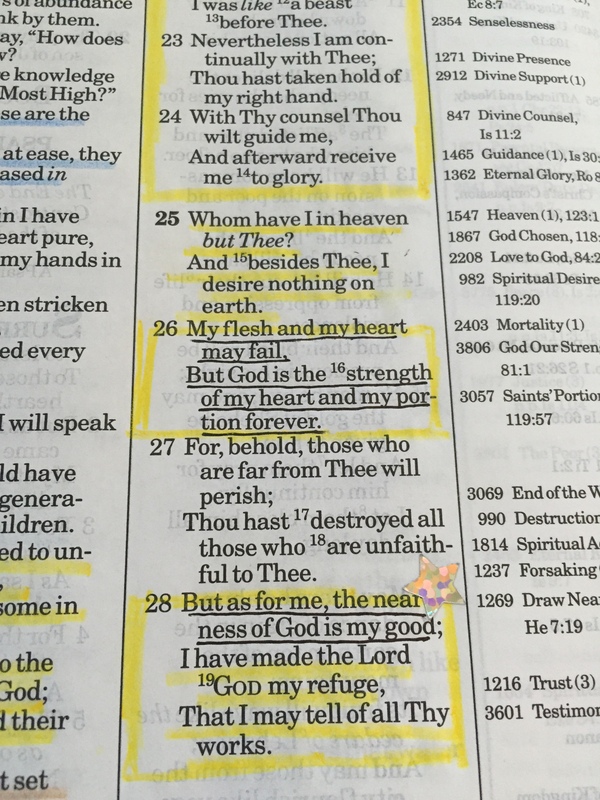 My Bible is a little…colorful. It’s got character, for sure. Why? See the 4 Reasons Why My Bible Looks Like A Demolished Rainbow. Since I’ve shared the why, I want to share the how. I keep a bag of 14 colored pencils, 1 mechanical pencils, 1 pen, 1 pencil sharpener, and an infinite number of wayward pencil shavings with me while I read. The mechanical pencil is for notes on the side, for writing in my Bible study notebook, and annotating other references that I keep handy. I underline as I go, but it usually causes me to read and re-read during my study, a fifth reason for me to use this system. And here’s the how of my Bible study. Sometimes, whole pages are colored purple, especially the ends of the letters in the New Testament. I underline these verses because they can be a reminder of my purpose, my “half of the bargain,” so to speak, and often a pep talk to get up and just do it. Blue underlines the most fear-inducing of all the verses, because wherever sin is death is soon to follow, and wherever blue verses are brown verses are sure to be near. (Brown is punishment.) 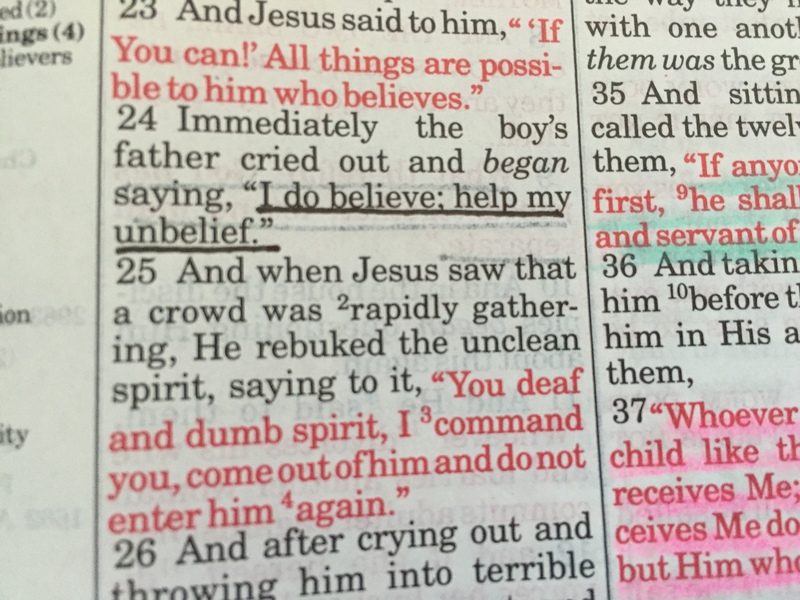 Why underline these sad verses? They define sin, they record sin for an example to me, and they make clear the difference between right and wrong. This color has evolved from New Testament principles to include truths in any book. It’s a generic category, yes, but it’s helpful to remember key principles. Prophecy is a difficult concept for me to grasp, so I like to keep track of them with a color. Not only do I underline the prophecies when they were made, but I also try to underline the prophecies as they are being fulfilled, which is doubly as tricky, but a great exercise in connecting the two. Do you know what God has promised for you? As I’ve studied through the prayers of the Bible this fall and winter season, I’ve noticed that they refer to the promises that God has given along the way. They reference them in thanksgiving but mostly in petition. It’s almost a hey-remember-that-thing-you-promised-me-when-is-that-gonna-happen kind of prayer, but the “great pray-ers” of the Bible prayed with these promises with complete reverence and faith. It shows belief in Him. No surprise, I like to underline things that uplift, encourage, and comfort. When I need to re-center, I can flip through these verses. They often overlap with other colors and categories: God’s love, God’s power, and favorites. Obviously, I don’t underline every event that ever happens in the Bible, but sometimes I want to be able to quickly reference some history. God is “rich in mercy” and He has “great love.” Passages and paragraphs and chapters of God’s love are recorded for our benefit. The Bible has a lot to say about God’s power. Sometimes His justice doesn’t make sense to us, but at the end of the day He is the definition of justice. Sometimes His power is scary– of course it is, He has the power to heal and to kill. But to me, His power is a manifestation of His love: “For He will avenge the blood of His servants.” Couldn’t we use a little more justice in this world? When God speaks to man, the most beautiful and powerful words ever are recorded. Second to God’s words to man are man’s words back to God. This simple prayer by Daniel is not presumptuous, with grand and fancy words, but humble, simple: Lord, listen, Lord, hear, Lord, forgive! Another color that’s not happy. And look at how many verses in a row of punishment verses there are! People respond to many different things: some cling to hope, some cling to purpose, some run from darkness, some run from punishment. Hey, God knows what He’s doing and these verses are recorded for us for a reason. What? What does that mean, “Important Ties”? The transition from the Old Testament covenant and the New Testament covenant gets sticky in my mind–not that it is sticky, but I struggle to understand the intricacies. I use this color to underline key verses that disclose how the two covenants fit perfectly into God’s eternal plan for the salvation of all. Aah, my favorite verses. These are the ones that chill me to the bone, change my frame of mind, or resonate with my soul. I couldn’t share just one. Happy studying! Share your thoughts and methods in the comments below! I deeply admire your dedication to studying His Words. What a brilliant way to lighten His truths and allow them to be soaked into your heart and daily living. I am also curious about your sticker use age…are there 14 shapes as well? Only three shapes, but almost all the colors. 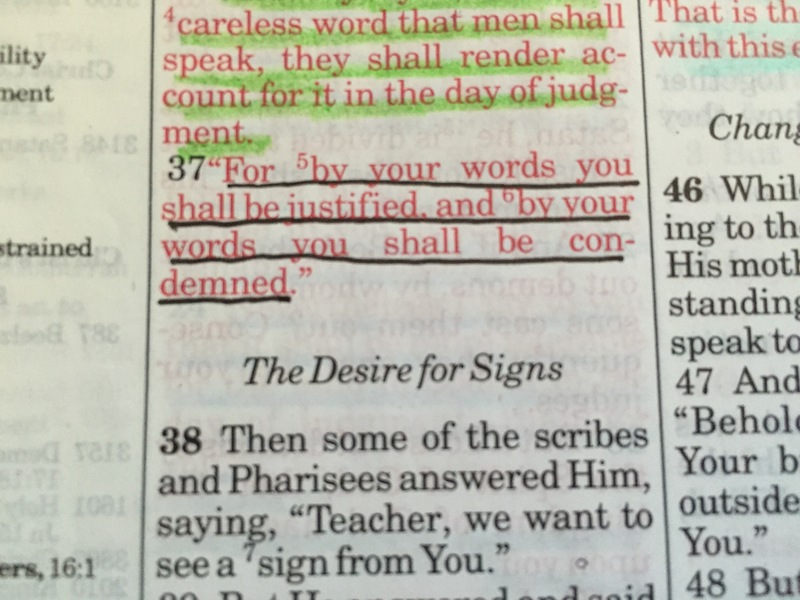 Because… you never know when a verse needs to stand out even more! I’d love to see a glimpse of your journaling Bible some day! Thanks, Katy! It’s so fascinating to me that everybody studies in different ways 🙂 I’d love to see how you organize your Bible studying thoughts!